The Clopton School Board made it official last week and named Deaven Omohundro the new coach of the Lady Hawks basketball program to replace Larry Lagemann. Lagemann announced his retirement from coaching recently following a 20-year bout that has included both the Clopton boy’s and girl’s programs and a couple of trips to state. Omohundro was one of the many students he coached over the years. She has served as his assistant for all four years she has been with the Clopton School District since signing on in 2013. 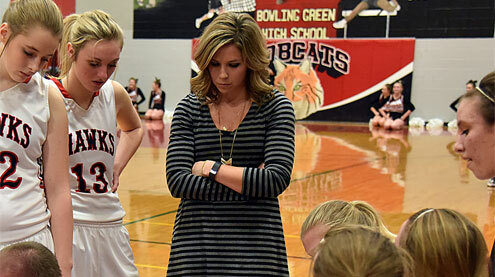 She has also coached the junior varsity team during that time and served as the junior high girl’s basketball coach for the past two years. She also teaches middle school math. Lagemann added that Omohundro was “extremely competitive” as a player and will bring that same level to the sidelines. Omohundro said she feels blessed to have been given the opportunity to take over the winning program. Lagemann started as an assistant to Ed Lindsay and Omohundro got her start under Lagemann. It’s difficult not to be excited for the future of Clopton basketball. Omohundro said she hasn’t had the opportunity to speak to the team as a whole yet as many were testing and taking trips last week. She added there will be many early morning workouts and practices as well as shootouts, all mostly in the month of June. She noted that she ready to get started and get back to the business of Clopton basketball.